RM 2/c Vergil Farris, son of Mr. and Mrs. J. M. Farris, attended Snyder High School. 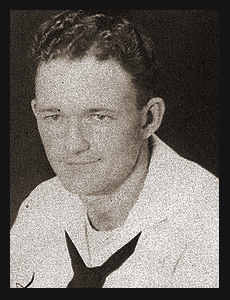 Entered the Navy in Oct., 1943, trained in San Diego, Cal. He served in Hawaii, Saipan, Tinian, Guam, the Philippines, Iwo Jima, Japan, and aboard the U.S.S. Stockham. Awarded Am. Theatre Ribbon, Asiatic Pacfic Ribbon with seven Battle Stars, Philippine Lib. Ribbon with two Battle Stars.